An Apple patent application published on Thursday suggests the company is interested in flexible, wearable displays, possibly with a future incarnation of the Apple Watch in mind. The patent documents a "conformable electronic device" and methods of making it, including using the use of LED arrays, controller chips, and a silicon substrate with a thickness at or below 50 micrometers. The application was originally filed in December 2014, and is credited to Andreas Bibl and Hsin-Hua Hu. Bibl was formerly the CEO of LuxVue, a display developer Apple acquired in 2014. The company specialized in low-power micro-LED technology, something that could potentially replace not just LCD technology but even OLED. To date it has been difficult to build micro-LED panels of any size, but something the dimensions of the Apple Watch might be more practical. Indeed Apple has followed a similar strategy with OLED. The Watch is so far the company's only product with the technology, but it's rumored to be coming to iPhones next year. In discussing flexibility, the patent specifically mentions the goal of a display with the "curvature for a bracelet or a wrist watch." That could open up the possibility of a more ergonomic Watch model with a display covering most or all of its surface. 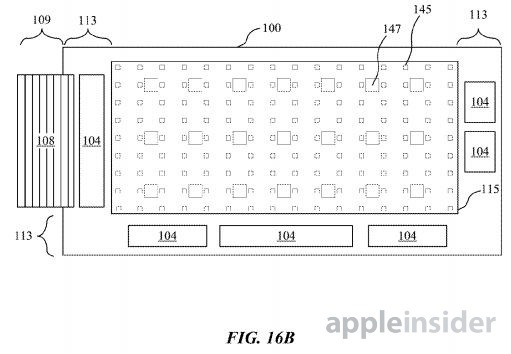 The filing also mentions the possibility of sewing displays into clothing, though that seems less likely from Apple given its current product lines. Apple is expected to introduce a new Watch later this year, though the main improvements should be a faster processor and possibly built-in cellular support.